Water: till channa is immersed. Pressure cook it with water & 1/2tsp salt for 3 whistles. Separate channa from water (don’t drain the water reserve it to use later). Heat oil in a deep sauce pan & add clove, cardamom, cinnamon, bay leaves. Add onion & sauté till light brown. Add turmeric & green chilly. Add ginger garlic paste & sauté it for 2 min. Add tomato cook till it gets soft & mashed up. Add little water if needed. Add coriander powder, channa masala powder, chilly powder, mashed kasturi methi & sauté for 1min. Add channa & salt, mix well gently so that channa are properly coated in the mixture. Add reserved water depending on how much gravy you need. Check & adjust the seasoning. Close the lid & cook it for 10min. 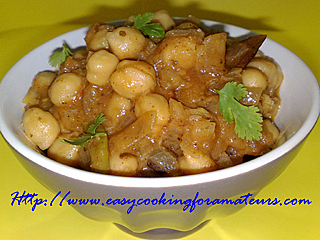 Channa masala goes well with Indian breads like batura, naan, chapatti, puri along with lemon & onion. mmmm slurp..the chana masala looks so inviting..too good..
That Channa Masala looks wonderful!